I have to admit I’ve never been much of a meal prepper before. Back in the days before baby, I had the luxury of what now seems like endless amounts of time to make myself breakfast in the morning, lunch at my leisure, and snacks on demand. Cooking dinner every night was a form of therapy for me. And any recipe testing or photo shoots for the blog served as my meal prep since all of the food went straight into containers to eat for lunch throughout the week. Fast forward to life with a newborn, and meal prep has become a vital survival strategy for me. I only have the use of one hand for most of the time that Baby Table is awake, since she likes being held All. The. Time. So I need to have nourishing food ready for me to eat for when I get a spare minute. 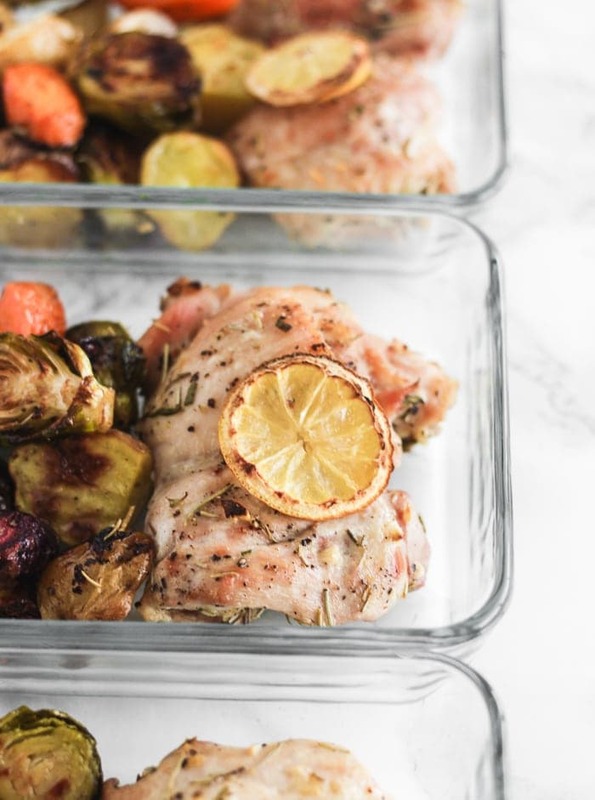 If you’ve seen the elaborate meal prep that some of your favorite Instagrammers or bloggers show off on social media, you may be overwhelmed and intimidated by the thought of trying it yourself. But it’s a skill that’s easily learned and can be so helpful for new moms or anyone with a busy schedule. Meal prep is supposed to make your life easier, not stress you out. You don’t have to go into your first meal prep session with a whole laundry list of recipes and tasks. Start with just an hour or two of prep one weekend and make something basic, like a batch of quinoa or rice for the week, and chop some vegetables or fruit and place in containers in the fridge. As you get the hang of it and become more confident, you can add more. Make dinner do double duty. If you’re already making dinner, why not double the recipe so you have leftovers? Just place them into individual containers for later meals. Or if you’re already heating the oven, pop in a couple sweet potatoes or a chicken breast to cook while it’s already on. Meal prep = done. Use up what you have. Before you make a big grocery store trip, take inventory of what’s in your refrigerator, freezer and pantry. If you’ve got something that needs to be used, turn it into the week’s meal prep. For example, you can roast a big batch of vegetables, using whichever vegetables are going to go bad soon. Have a plan for what you want to make and make a list before you shop so that you won’t impulse buy too much food. And be realistic for what your schedule will allow. I also like to plan for a little flexibility in case a few meals don’t get eaten when scheduled. That way, food doesn’t go to waste. Need more instruction for meal prepping, or just need healthy meal prep inspiration? Smart Meal Prep for Beginners, by fellow dietitian Toby Amidor, if full of easy, healthy recipes and weekly meal plans to help you get organized, as well as step-by-step meal prep instructions. 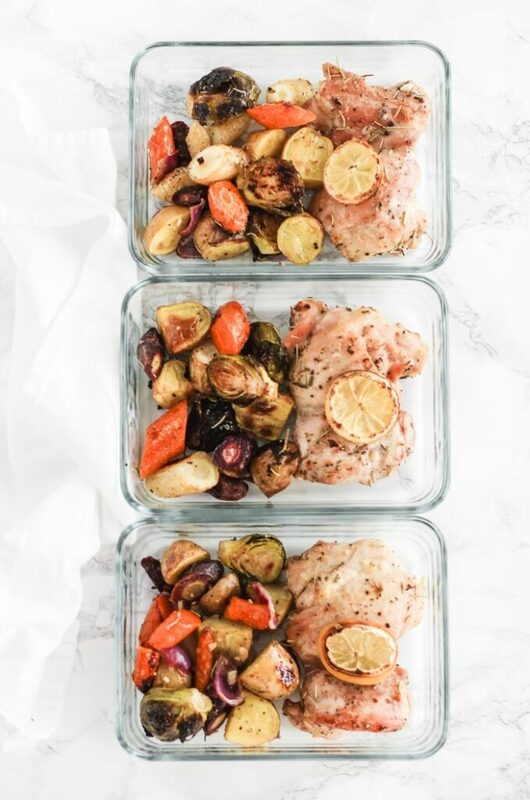 The weekly meal prep plans start easy with just 3 recipes per week, and let you work your way up progressively. The cookbook also contains lots of practical meal prep tips for beginners, Dos and Don’ts of meal prepping, and shopping lists to help you get going. There are also tons of recipes for staples and sauces, breakfasts, lunches and dinners, side dishes, and snacks, all with handy dietary specifications, so you have endless inspiration for whatever ingredients you have on hand. You can pre-order Smart Meal Prep for Beginners now on Amazon! 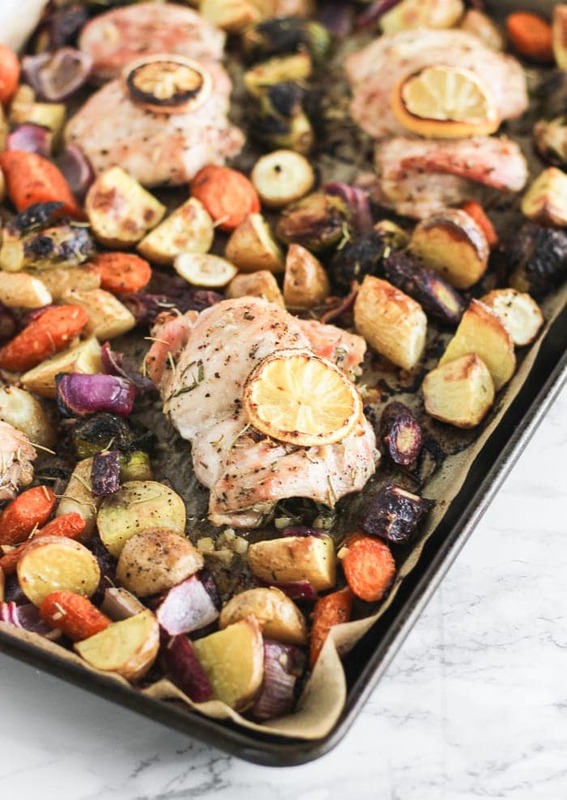 And in the meantime, try this delicious recipe for meal prep sheet pan lemon chicken with carrots and potatoes. Enjoy! I was provided a copy of this cookbook for review purposes. As always, all opinions are my own. Preheat the oven to 425 ̊F. 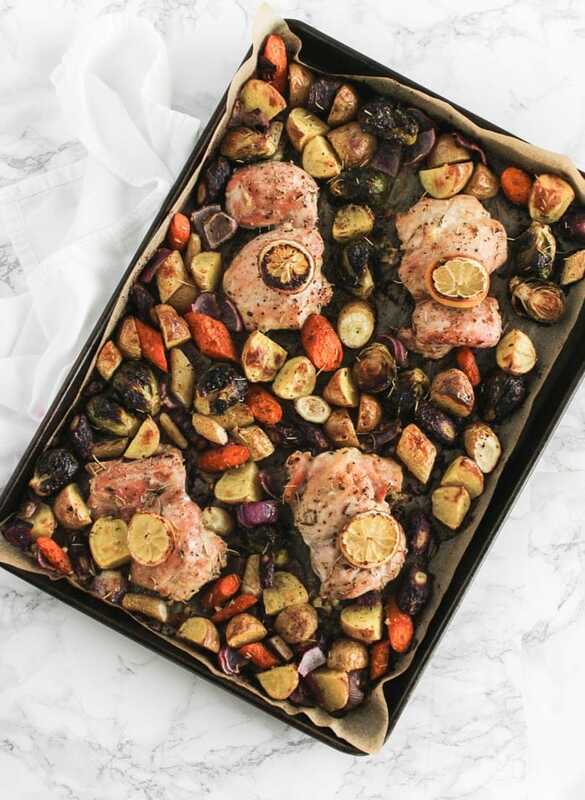 Coat a sheet pan with cooking spray. 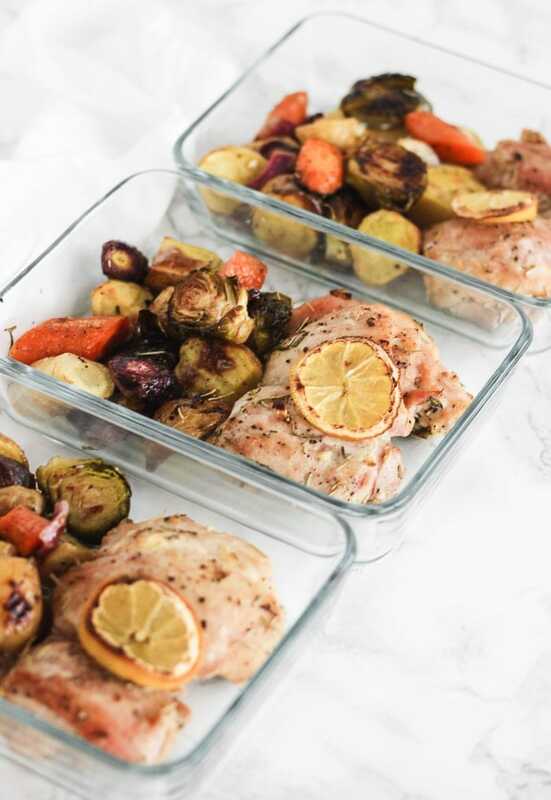 Gently pour the vegetables and chicken onto the prepared baking sheet, making sure they are in a single layer. Top with the lemon slices. 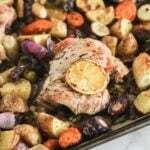 Place in the oven and roast for 40 to 45 minutes until the chicken reaches a minimum internal cooking temperature of 165 ̊F. Storage: Place airtight containers in the refrigerator for up to 1 week. To freeze, place freezer-safe containers in the freezer for up to 2 months. To defrost, refrigerate overnight. To reheat individual portions, microwave uncovered on high for 2 to 2 1⁄2 minutes.